or contact us directly on +27 (0)21 874 1711/1292. From the airport onto the N2 - Somerset West direction. Turn onto off ramp exit 33 - Baden Powell Drive. Turn left from off ramp onto R310. The road will pass Spier Wine Estate on the right. The road will come to a T-junction with traffic lights, turn right towards Stellenbosch onto Adam Tas Road. Stay on the left-hand side of the road. Pass the Stellenbosch train station on the left. From station, 5th traffic lights, look out for sign Franschhoek/Ida's Valley - turn right onto R310. Pass through Pniel and Boschendal Wine Estate on your right, until a T-junction. Allee Bleue Wine Estate will be in front of you. Turn right, towards Franschhoek on the R45. Travel +/- 5 km. 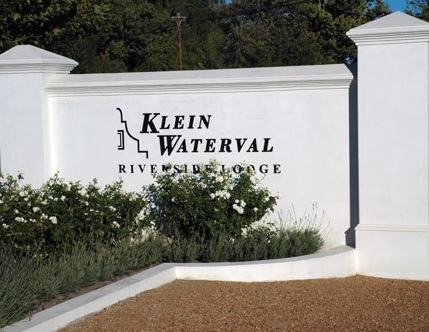 After blind bend turn left into Klein Waterval Riverside Lodge. 1km before Berg River Bridge. Follow the N1 from Cape Town to Paarl. Turn onto exit 47(Klapmuts/ Wellington/Stellenbosch) off ramp. Turn right from off ramp underneath N1, straight, over 4-way stop. +/- 400meters from 4-way stop, turn left (Franschhoek sign). +/- 10km, T-junction turn right onto R45 (Vrede & Lust is on your right) towards Franschhoek. Follow the R45 for about +/- 8km. After blind bend turn left into Klein Waterval Riverside Lodge. Come over the Franschhoek Mountain Pass till you get the Huguenot monument on your left. Turn right into Franschhoek on the R45. Drive through Franschhoek, +/- 10km on the R45 direction Paarl. Klein Waterval is on your right-hand side, 1km after the Bergrivier Bridge.